Dividend stocks are everywhere, but many just downright stink. In some cases, the business model is in serious jeopardy, or the dividend itself isn't sustainable. In others, the dividend is so low it's not even worth the paper your dividend check is printed on. A solid dividend strikes the right balance of growth, value, and sustainability. Today, and one day each week for the rest of the year, we're going to take a look at one dividend-paying company that you can put in your portfolio for the long term without much concern. This isn't to say that these stocks don't share the same macro risks that other companies have, but they are a step above your common grade of dividend stock. This week, I'm looking at waste services company Waste Management (NYS: WM) , and I'll show you how one person's trash really can be another person's treasure. The business itself isn't pretty. In fact, some might even say it downright stinks. But, despite the smell, Waste Management sure can produce a healthy and seemingly continuous stream of cash flow. Without digging deep, you might think Waste Management's services end at trash collection, but you'd be wrong. The company is the nation's largest recycler and reaps the benefits of reusing discarded materials. It also has an energy generation segment that converts waste into energy, as well as methane into energy, which is then used to power about 1 million homes. As Foolish colleague Selena Maranjian pointed out this week, Waste Management's plans are to double that total by 2020. Finally, the company also generates cash flow by charging smaller waste disposal services to use its landfill. There's a clear advantage to being the nation's largest waste management services provider. No waste company boasts the pricing power that Waste Management possesses, nor does any have the capacity or the balance sheet to "go green" to the level that Waste Management has. One of the biggest risks, of course, remains industrywide consolidation. Republic Services (NYS: RSG) , the second-largest waste services company, agreed to purchase Allied Waste, then the third-largest waste services company, in 2008 in order to rival Waste Management's dominant sector presence. WCA Waste (NAS: WCAA) also fell under the consolidation bug, recently agreeing to be purchased by Macquarie Investment Partners. No matter how hard they try, I don't feel these businesses can hold a candle -- or a Glade air freshener --to Waste Management. Veolia Environnement (NYS: VE) boasts a remarkably high dividend yield of 12%, but that dividend will be cut drastically, and the company is only expected to earn $0.63 in 2012. Similarly, Waste Connections (NYS: WCN) offers a growth rate comparable to Waste Management's, but it does so with a dividend yield of just 1.1% and a forward P/E near 18. 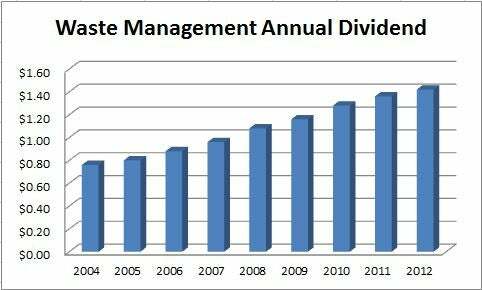 The above data includes the fact that in December Waste Management approved boosting its dividend by 4.4% to $0.355 per quarter in 2012. Waste Management is the type of company that will allow its shareholders to sleep easy at night. Its business is sustainable (i.e., there will always be trash), it's growing (more people means more trash), and the possibilities for it to use its technology to harness energy from waste is practically endless. This is a stock that could be down in the dumps all day and still come out looking like a winner. If you're craving even more dividend ideas, I invite you to download a copy of our latest special report, "11 Rock-Solid Dividend Stocks," which is loaded with income-producing companies hand-selected by our top analysts. Best of all, this report is free, so don't miss out! At the time this article was published Fool contributor Sean Williams has no material interest in any of the companies mentioned in this article. He'll gladly talk about a company's liquid assets over lunch, unless it involves the waste services sector. You can follow him on CAPS under the screen name TMFUltraLong, track every pick he makes under the screen name TrackUltraLong, and check him out on Twitter, where he goes by the handle @TMFUltraLong. The Motley Fool owns shares of Waste Management. Motley Fool newsletter services have recommended buying shares of Waste Management, Republic Services, and Veolia Environnement, as well as writing a covered strangle position on Waste Management. Try any of our Foolish newsletter services free for 30 days. We Fools don't all hold the same opinions, but we all believe that considering a diverse range of insights makes us better investors. The Motley Fool has a disclosure policy that always loves a free payout.